Very few things in this world are more tasty than hot corn off the grill, especially if you know how to cook corn on the grill to perfection. Here’s the best way I’ve learned how to cook corn on the grill. You can add as much corn as you want to this recipe, but for our purposes lets stick with an easy two ears of corn. There are two ways to cook corn on the grill, one is to remove the corn husks and silk and put them on the grill and the other way to cook the corn is to leave only the last few husks of corn on and grill them that way. This will hold in the flavor and produce awesome results. Making sure that the grill is nice and hot, place each ear of corn on the grill. Let each side cook for three minutes and than use a pair of tongs to turn the corn over as they cook. Total time on the grill should be about 15 minutes. One thing to keep in mind is not to panic if the corn starts getting burned black at the edges during the cooking process. It’s a natural part of grilling corn and actually adds to the flavor. 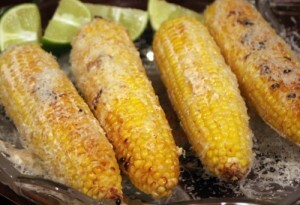 Once the corn is off the grill, add butter and salt and pepper to taste. As this is a summertime side dish, it is best with things like ribs, steak, grilled chicken, or can even be served alone for a light lunch.